Want to pitch your startup, make connections and win cash and other prizes? Want to drink free beer, listen to awesome ideas and cheer on general entrepreneurness? Then you better come to the eighth annual unConference, scheduled for 2 p.m. to 4:30 p.m. Tuesday, Oct. 17. This year we’re maintaining the un — that is a casual, fun, low-tech pitch fest, no powerpoints, no lengthy presentations, no stress — and adding more fun. The event will be at Thump @ the 1001 Tech Center. All are welcome. 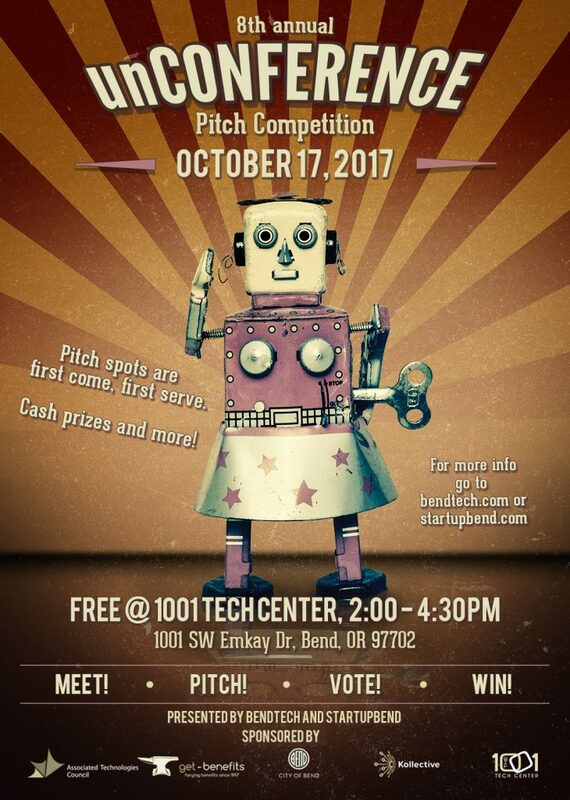 It’s organized by BendTECH and StartupBend, and sponsored by Kollective, the City of Bend, Associated Technologies Council and the 1001 Tech Space. Startup founders can sign up to pitch as soon as the door opens. We’ll up to 18 slots and they are first come, first serve. We’ll listen. We’ll cheer and ring cowbells in support of good ideas. The audience will vote. And then we’ll announce the winners. Up for grabs are cash prizes of up to $1,500, a community desk membership at BendTECH, a Bend Venture Conference ticket and more. The BendTECH coworking space will be open during and after the event for those who want to tour the space, meet our member startups and businesses and learn more about the nonprofit that runs this awesome community asset. Students are welcome at unConference. Enthusiasm in encouraged. So take a break from your desk and come on out. See you there! Pitches start at 2:30 p.m. Winner announced at 4:30 p.m.
Any startup founder or aspiring founder can sign up to pitch. You get a microphone and three minutes and the rapt attention of a 100+ of the nicest audience members. Don’t ask to show a deck. Sign ups to pitch are first come, first serve. You can sign up beginning at 2 p.m. Sometimes there’s a line. A big thanks to our sponsors Kollective, the City of Bend, Associated Technologies Council and the 1001 Tech Space for supporting the unConference and entrepreneurship in Central Oregon.